Hood River County residents and volunteers for the Hood River Water Protection measure delivering the signatures to qualify for that ballot (that passed last May in a landslide vote). As we are all still reeling from the election, many people are questioning what the next four years will look like. What will happen to all of the social and environmental progress we’ve made? What should we focus on? Who should we target? What can we as individuals do to make a difference? Can we make a difference? Now –more than ever– what we do locally matters. In fact, the only way we’re going to get through this tough time in America is for people to strive for change at the local level. Look back at the progress we’ve made on this campaign to keep Nestlé out of the Gorge in 2016 alone. Working together with the local community and the Local Water Alliance we passed a ballot measure banning commercial water bottling in Hood River County. We were successful because we took action locally. Local Water Alliance held rallies, press conferences, and made thousands of phone calls and knocked on hundreds of doors to win the ballot measure by a landslide. Those of us who know Nestlé would be harmful to the Gorge and its residents helped to educate voters about the dangerous risks of a large-scale water bottler in the region. 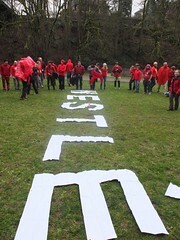 We have been so successful in stopping Nestlé on the Oregon side of the Gorge that Nestlé has initiated discussions with towns on the Washington side. Waitsburg city officials told Nestlé to keep on walking. Goldendale area residents came out in the hundreds to tell their city council they don’t want any business with Nestlé. This progress was made under an Obama administration, but it could have happened under a Trump administration. 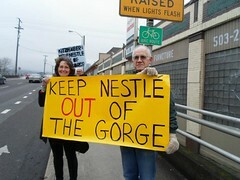 We will continue to strive for progress on this campaign until Nestlé packs its bags and leaves the Gorge for good. Along with focusing on issues locally, we must stand in solidarity with the tribes. They are powerful sovereign nations whose rights must be respected and we will stand in solidarity with them, whether it be at Standing Rock or Oxbow Springs. On December 4th, the Standing Rock Sioux celebrated a victory when the U.S. Army Corps of Engineers announced it would not grant the final easement required for the completion of the Dakota Access pipeline under the Missouri River at Lake Oahe. This milestone victory was a result of solidarity. Thousands of water protectors and veterans have gathered at the camps to stand in solidarity with the Standing Rock Sioux and other indigenous tribes in North Dakota, where they faced mace, water cannons in freezing weather, rubber bullets, and unjust treatment from American police officers and security forces. It is crucial that we keep in mind this does not stop construction of the pipeline for good. Energy Transfer Partners has stated it is fully committed to completing the pipeline in its original route. Alternative routes may be considered; Energy Transfer Partners may disregard the denial of a permit and attempt construction under Lake Oahe anyway. This seems all too familiar. We passed a ballot measure yet Nestlé is still trying to build its water bottling facility in Cascade Locks. It is important that we celebrate our victories, but it is also important that we stay vigilant to make sure we don’t lose the crucial ground we have gained. We can do that by continuing to organize and take action in solidarity with all of our allies. Together we can win against the largest food and beverage company in the world. Together we can achieve that victory in the Gorge, on the local level. As this sunset image reminds me, the scenic Columbia River Gorge is a unique and special place worth protecting. There is no place on the Oregon or Washington side for a Nestlé water bottling facility. This is why we remain vigilant in the fight to keep Nestlé out of the Gorge. After hitting some serious roadblocks to its proposal for Cascade Locks in Oregon, Nestlé has made a bold move and initiated discussions with Goldendale city leaders about building a water bottling facility. The multinational seems to have made the same offer to the Washington city of Goldendale as it did to Cascade Locks, a $50 million plant promising 40-50 jobs, but at what cost to our water systems? Mayor Mike Canon believes the water bottling facility won’t affect Goldendale’s water supply, but given the reality that bottling water innately removes millions of gallons from the watershed makes his line of reasoning hard to follow. Nestlé takes the water and it doesn’t put it back—this is the nature of the bottled water industry. At the city council meeting this upcoming Monday, November 7 at 7 p.m. held in the Goldendale City Council Chambers, the public will have a chance to weigh in. If you live in Goldendale or the surrounding areas, PLEASE COME OUT to the meeting to testify and tell your city leaders that you don’t want Nestlé. If you have any friends who live in Goldendale or the surrounding areas, PLEASE ENCOURAGE THEM TO ATTEND the meeting and tell their city leaders that any business with Nestlé is unwanted. We made a commitment to keep Nestlé out of the Columbia River Gorge, and that commitment doesn’t stop at the state border. We will expand our fight to the Washington side. 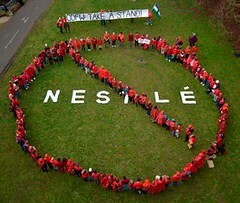 We won’t stop to keep Nestlé out of the Gorge. Why We Must Keep Up the Fight to Protect Our Water! As Anna Mae Leonard and JoDe Goudy chanted a mesmeric prayer song, captivating the audience of environmentalists, reporters, bystanders, and tribal members alike, a veil of respect and resolve set in. We were standing on the steps of Oregon’s State Capital, at a press conference hosted by Keep Nestlé Out of the Gorge coalition groups to show solidarity with Anna Mae and the Columbia River Fishing Tribes. Anna Mae fasted for five days, without food or water, the week of September 19th, a week chosen to coincide with state legislators convening in Salem for the State Legislative Days. She fasted to bring attention to the Oregon Department of Fish & Wildlife’s (ODFW) disregard of treaty rights and the region’s tribes’ wishes to protect sacred water from Nestlé. By moving forward with the water exchange process for Nestlé’s benefit, ODFW is also ignoring a majority of Hood River County voters and the law they voted into effect prohibiting all commercial water bottling. Governor Kate Brown, who has the power to force ODFW to pull out of any deal with Nestlé, has yet to take a stand or act on the issue. Her inaction leaves Oregon residents no choice but to question whose side she is on—it certainly seems preferential to Nestlé and against the residents and Tribes of the Gorge. My introduction to Food & Water Watch has been a plunge-right-in approach and it has been equal parts invigorating and infuriating. Infuriating because I’ve come to learn that you can PASS A LAW that bans a corporation from doing something, and that corporation will still try to do that exact thing. In May, 69% of Hood River County voters passed a ballot initiative that banned commercial water bottling, yet Nestlé is still moving forward with its plan. Last year, President Obama vetoed a bill authorizing the Keystone XL Pipeline, but the pipeline battle cropped up elsewhere. Now indigenous peoples are on the frontline in North Dakota protesting the Dakota Access Pipeline—the northern part of two pipelines that together follow a similar path to the Keystone XL Pipeline. Both Nestlé and Big Oil are moving forward in some way or another. Corporations are not entitled to our public resources and we cannot afford to not stand up to them. The experience at the Oregon State Capitol has reinvigorated my desire to fight these corporations, because I’m surrounded by people who are fighting harder and sacrificing more than I ever could. Anna Mae Leonard gave up food and water for five days for this cause. 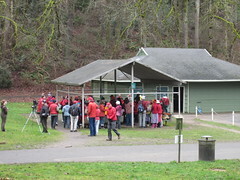 JoDe Goudy, chairman of the Yakama Nation, stated the Yakama Nation will sue the state of Oregon if Nestlé is authorized to commercially bottle water in Oxbow Springs. Last month peaceful protesting members of the Standing Rock Sioux were confronted with pepper spray and dogs while expressing their opposition to the Dakota Access Pipeline that would threaten their water and sacred sites. JoDe Goudy was among the thousands of indigenous peoples that gathered, who traveled great distances and camped in areas cutoff from water and sanitation resources in order to demonstrate their opposition to the pipeline. On September 21st, Food & Water Watch, Local Water Alliance, Bark, Oregon AFSCME, and Oregonians stood in solidarity with Anna Mae, JoDe Goudy, and the Columbia River Fishing Tribes. Just as indigenous communities were not consulted or considered in the Dakota Access Pipeline project, the Columbia River Fishing Tribes were not adequately consulted on the state’s water exchange process for Nestlé’s profit. Governor Kate Brown even declined to meet with JoDe Goudy on the 21st or with Anna Mae Leonard at any point during her five day sacrifice. Within my first month as the northwest organizing intern at Food & Water Watch, I’ve developed a greater amount of respect for those who take a stand. If Oregon residents and the Columbia River Fishing Tribes aren’t holding Governor Brown and ODFW accountable, if environmentalists and the Standing River Sioux aren’t protesting in North Dakota – if we don’t take a stand – then our increasingly scarce water resources will be comprised. We can’t let that happen. Rachel O’Keeffe, northwest organizing intern for Food & Water Watch. 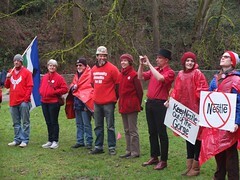 Nearly a year ago to the date Columbia River fishing tribes rallied with allies at the Oregon State capitol to tell Governor Brown to stop the Nestlé bottling proposal. It is time to remind her that we aren’t going away-she needs to respect the will of Hood River county voters and the Tribes by stopping the Nestle bottling proposal. Last May, we celebrated our momentous victory when the Hood River County Water Protection Measure passed with the support of 69 percent of voters, banning commercial water bottling countywide. But the fight isn’t over yet. The Oregon Department of Fish and Wildlife (ODFW) is still moving forward with the water exchange application process intended to make state water resources available to Nestlé. Next week, state legislators will meet in Salem for their Legislative Days from Wednesday the 21st to Friday. It’s the perfect opportunity to have our voices heard. Of course, we’re not the only ones upset about this issue. Beginning Monday, Anna Mae Leonard will start fasting without food or water for five full days in response to the ODFW ignoring the wishes of the Columbia River fishing Tribes to protect increasingly scarce natural resources from Nestlé. Anna Mae will be resolute in her determination to bring light to this important message, remaining on the state capitol steps from sunrise to sunset, Monday to Friday. Come show your support for Anna Mae and her sacrifices for this important cause in Salem anytime next Monday to Friday from sunrise to sundown. Bring signs targeting Governor Brown asking her to tell ODFW to pull out of the water exchange process. And please show Anna Mae Leonard the respect she deserves. The Keep Nestle Out of the Gorge coalition groups and the Local Water Alliance are showing solidarity by hosting a press conference on Wednesday at the capitol and will be joined by tribal fishing people as well as citizens from the Gorge and throughout Oregon. Come show your support for this powerful moment in this campaign against Nestlé at the press conference on Wednesday the 21st at 10:30am on the state capitol steps (900 Court St. Salem, OR). Signs will be provided, feel free to bring your own sign asking Gov. 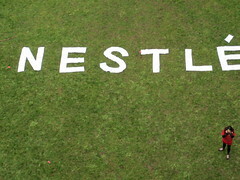 Brown to Say No to Nestlé. If you can’t make it to Salem next week, you can still support the week of action by raising visibility on this urgent issue and spread the message through social media. Share photos posted by Food & Water Watch, the Local Water Alliance, and Bark share articles published about the week’s events, and tell your friends that a woman is FASTING FOR FIVE DAYS in response to this issue. Call (503-378-4582) and/or email Governor Brown’s to let her know that you expect her to respect the will of Hood River County voters and to respect the Columbia River fishing Tribes by telling ODFW to stop its water exchange proposal for Nestle. Please spread the word and tell your friends and family about this; the more people who know that the Hood County Water Protection Measure didn’t stop ODFW or Nestlé, the more people will pressure Governor Brown to use her power to stop them. Local Water Alliance supporters showed up in force in Hood River to urge voters to vote YES on the Hood River Water Protection Measure (14-55). Ballots are in the mail supporters are encouraging voters to fill out their ballots and turn them in ASAP. Hood River County, OR – Today, volunteers with the Local Water Alliance held a rally in downtown Hood River and gave away free glasses of water to people on the street and in passing cars to mark the arrival of ballots that will decide whether Hood River County becomes one of the first in the nation to prohibit industrial-scale bottled water operations. Measure 14-55, the Hood River County Water Protection Measure, was proposed by a coalition of residents, farmers and Native Americans and heads to voters less than a year after Hood River County was under an emergency drought declaration. Nestlé has proposed a water bottling plant in Cascade Locks which would use over 238 million gallons of publicly-owned water a year, and creating more than approximately 1.6 billion plastic water bottles each year. Measure 14-55 would legally block the Nestlé plant, which would be the largest such plant in Oregon, but backers of the measure say it’s about much more than just the Nestlé project. Over 100 Businesses and Farmers Announce Support for The Hood River County Water Protection Measure 14-55! Hood River County, OR – The Local Water Alliance announced today that over 100 local businesses and farms have officially endorsed the Water Protection Measure 14-55, which would prohibit bottled water operations in Hood River County. The long list of businesses, farms and farmers highlights the importance of protecting Hood River County’s water supply from water bottling efforts by Nestlé and other water bottlers. A Nestlé-backed political action committee calling itself “Coalition for a Strong Gorge Economy” recently filed with State Elections, listing a Salem political lobbyist as its main group contact. Measure 14-55 backers say their impressive list of local farm and business endorsers highlights that a broad spectrum of voters understands that trucking out hundreds of millions of gallons of water a year would set a precedent that would put the County’s economy at risk. “Business after business that we talked to recognized that we cannot set the precedent of allowing Nestlé or any other industrial-scale water bottler into our County. This is not just about Nestlé because if we let Nestlé in, then many other water bottlers will soon follow their lead,” says Aurora del Val, who lives in Cascade Locks and is the Campaign Director for the Local Water Alliance. It’s been a big couple of weeks. Last Friday a PAC was formed to run the opposition campaign against the Hood River Water Protection Measure. The PAC, the Coalition for a Strong Economy, has hired a consultant, Rebecca Tweed, along with one of the most expensive political consulting firms in the state of Oregon. We haven’t seen where the big money is coming from yet, but we’ll find out. I suspect the next round of reporting may show Nestlé and the International Bottled Water Association are bankrolling efforts to kill the popular ballot measure in Hood River County that would prohibit any commercial water bottling. You can call it a hunch. On March 22, World Water Day, the Story of Stuff released their film Our Water, Our Future. Nestlé executives saw the promotion for the film and decided to release a video of their own in response on the same day. It seems that this multinational giant with deep pockets feels threatened by the power of a community fighting to protect their most precious resource: water. And Nestlé should be worried, because common sense and democracy are on our side. The ballot measure campaign in Hood River County will only ramp up as May 17th approaches and Nestlé attempts to mislead voters into voting against their best interests. But the Local Water Alliance has the power of the people on their side. With countless volunteers calling voters and knocking on doors, no amount of spin that Nestlé can buy can compete. For more information on the campaign and what you can do to support please visit the Local Water Alliance website and Facebook page.